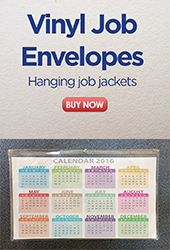 Store and transport documents, photos and graphics projects in our Job Envelopes, Job Jackets and Vinyl Zip-Lock Bags. Choose among many sizes, shapes, weights and applications for your project organizing needs. The extra front pockets give this 8.5 gauge vinyl envelope its name. We've added pockets to our oversized envelopes and our customers have found hundreds of uses for these Oversized Kangaroo Envelopes. Now you can post instructions, notices and signage for easy viewing on metal surfaces such as cabinets, machinery and more. Removing is just as easy as applying these handy envelopes.